The taught component of Term 1 of the 2014-2015 academic year at the Library and Information Science scheme at City University London has finished today. #citylis is our hashtag and it is used by staff, students and members of the public. Throughout the term I archived the Tweets tagged with #citylis and I have now uploaded to figshare a spreadsheet containing 4940 Tweets (there’s likely to be some duplicates there, and it includes retweets). 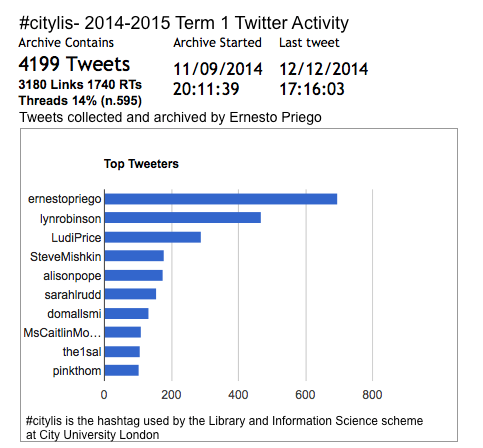 Priego, Ernesto (2014): A #citylis 2014-2015 Term 1 Twitter Archive. figshare. All the usual information about collection methods, limitations etc. are included in the ReadMe sheet of the file. The data is shared as is. This dataset is shared to encourage open research into scholarly activity on Twitter. If you use or refer to this data in any way please cite and link back using the citation information above.